Whatever your opinion about the huge, online reference work called Wikipedia.org, unless you are using its vast resources to supplement your genealogical research, your work is not as accurate or complete as it could be. Of course, you could do something simple, like look up the names of your ancestors and all their iterations in Google and you might find that one or more of those ancestors were the focus of a Wikipedia article. Such as this article on my Great-grandfather. But if you are thinking of Wikipedia in that fashion, you are probably missing the bulk of the useful articles. As a genealogist, you should be aware that Wikipedia is likely the most complete gazetteer for information about the world and it's populated places that exists. Here is an example. This entry seems to be as complete as it might be under the circumstances. It might help to note that there are no sources noted, other than personal records, that support this information. 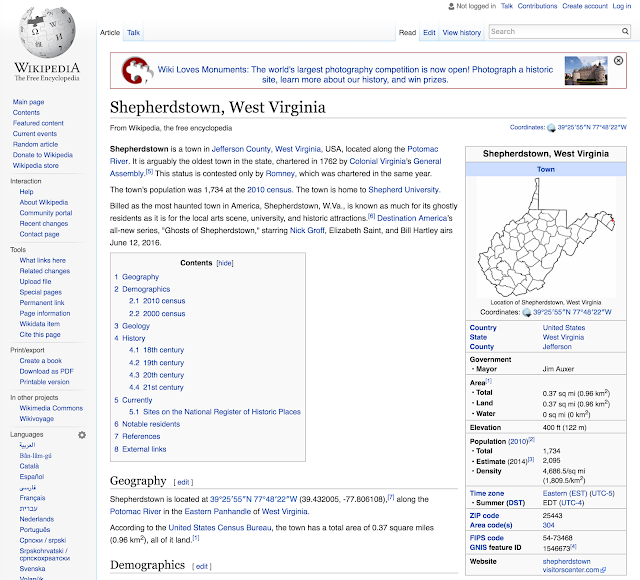 So, a quick check to Wikipedia.org about Shepherdstown and Berkeley County. Let me repeat. 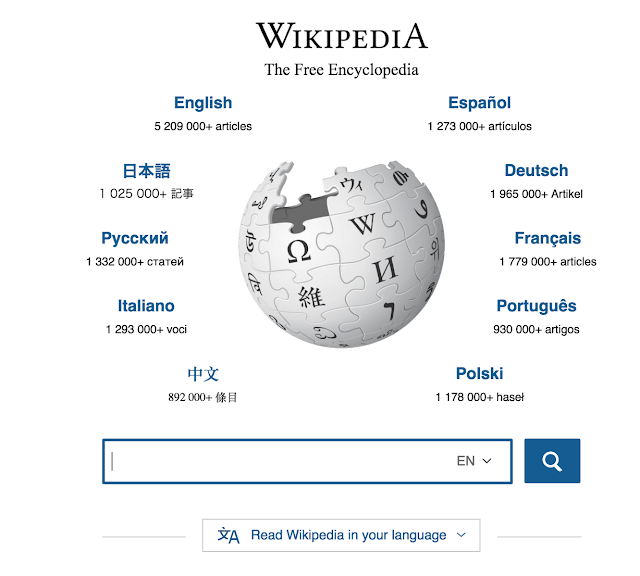 Wikipedia.org has a page for almost every populated place in the world. I immediately notice that Shepherdstown is "one of the oldest town in the state, chartered in 1762 by Colonial Virginia's General Assembly." It is now in West Virginia but before West Virginia became a state in 1863, it was part of Virginia. Hmm. So the entry here shown above and many of the other references to Shepherdstown are not at all accurate. The town did not exist in 1723. Price, Jim. "History of Shepherdstown". Archived from the original on October 1, 2000. Retrieved April 3, 2015. The links go to a webpage. Here is a screenshot. Colonial settlers began their migration into the northern end of the Shenandoah Valley in the early 1700's. The Colony of Virginia started issuing Valley land grants in the 1730s. In 1734, Thomas Shepherd was granted 222 acres, on the south side of the "Potomack" river. From that tract, he selected fifty acres and laid out a town. He named his town Mecklenburg and petitioned the Virginia Assembly for a charter. It was granted in 1762 and was located in Frederick County. Thomas Shepherd was the sole trustee. He owned the town and had the responsibility to conduct its government. 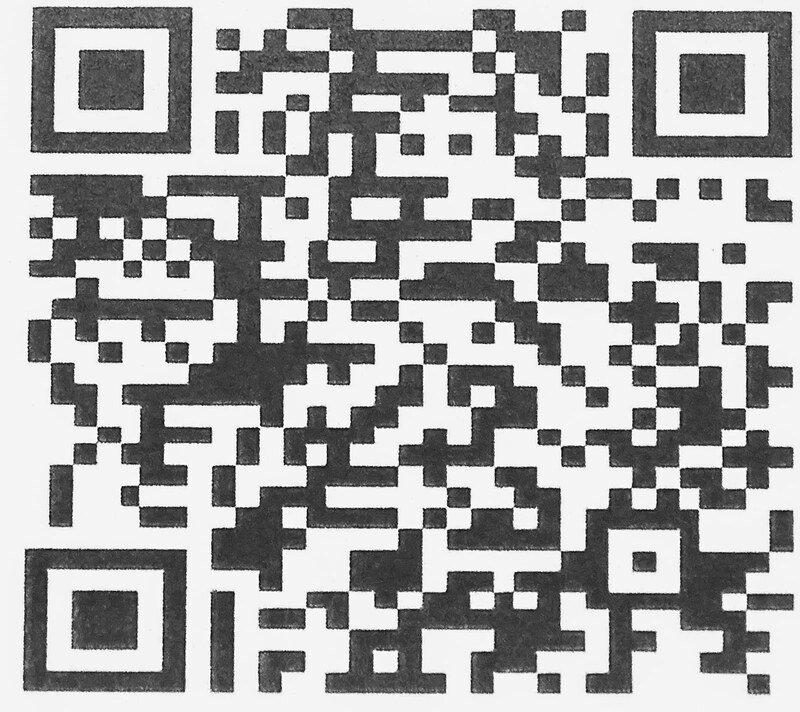 Here is another issue. 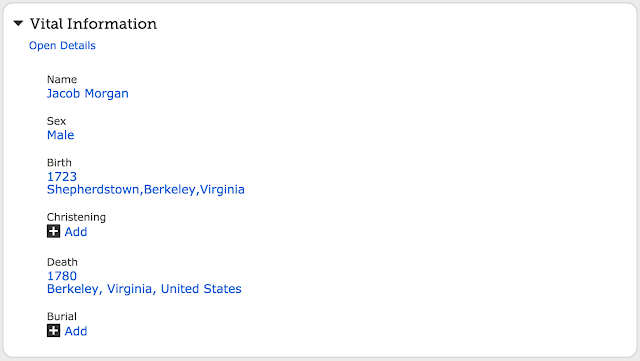 Shepherdstown is in Jefferson County not Berkeley County. Was it in Berkeley County back in the 1700s? That question calls for another Wikipedia search. 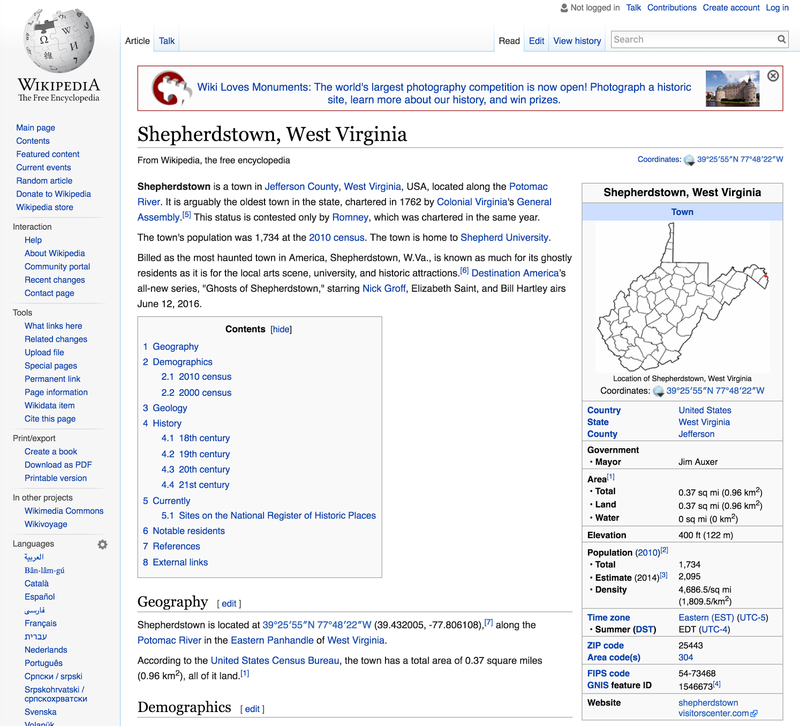 Here is what the article from the Wikipedia: Berkeley County, West Virginia has to say. Berkeley is the second oldest county in West Virginia. The county was created by an act of the House of Burgesses in February 1772 from the northern third of Frederick County (Virginia). At the time of the county's formation it also consisted of the areas that make up the present-dayJefferson and Morgan counties. 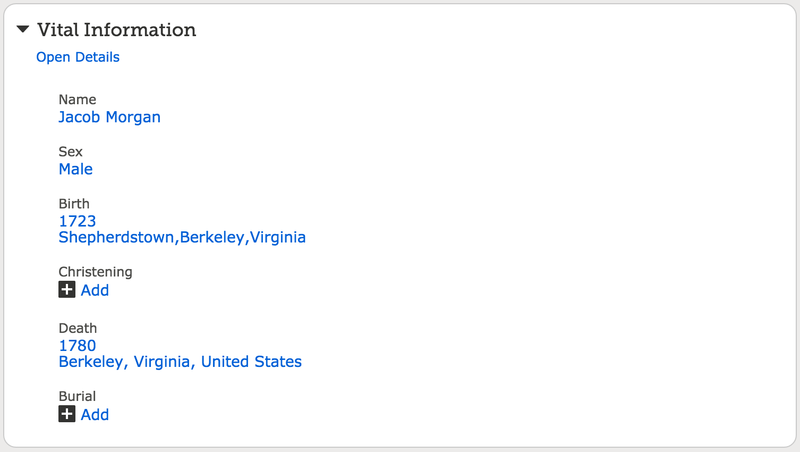 With this very brief search, I am able to determine that my ancestor Jacob Morgan was not born in Shepherdstown, Berkeley, Virginia. I do not yet know where he was born, but I do know that more research is needed on his birth. 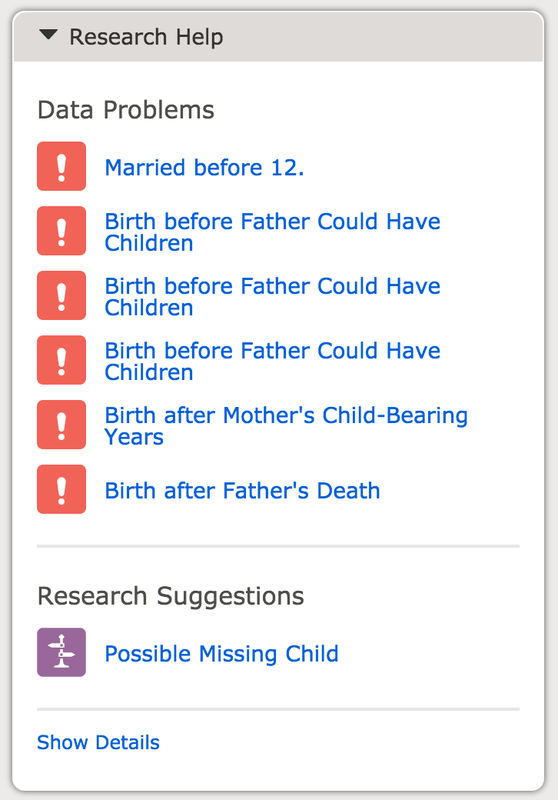 Since this entry for Jacob Morgan has the following notices from FamilySearch, it is probably not too surprising that the places named for him and his family members may also be wrong. 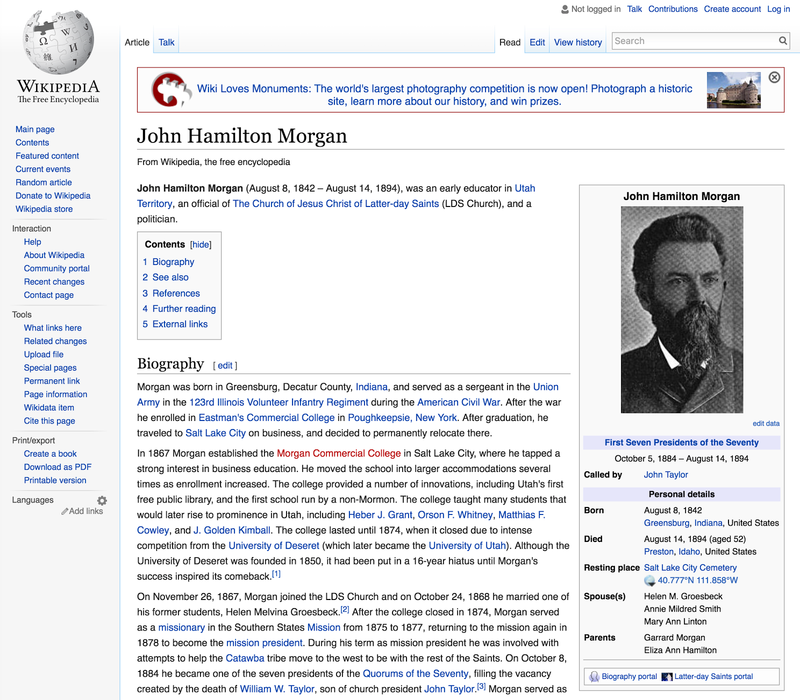 I routinely check the accuracy of the entries in the Family Tree against those from Wikipedia. Where necessary, I go back to the originally cited material. If you are wondering why these entries haven't been researched and checked, as I have stated recently in another post, we are working on this line and all of these people may not be related to us at all. So, use Wikipedia as an initial place to check the facts for any unsubstantiated entries in the FamilySearch.org Family Tree or any other family three out there.